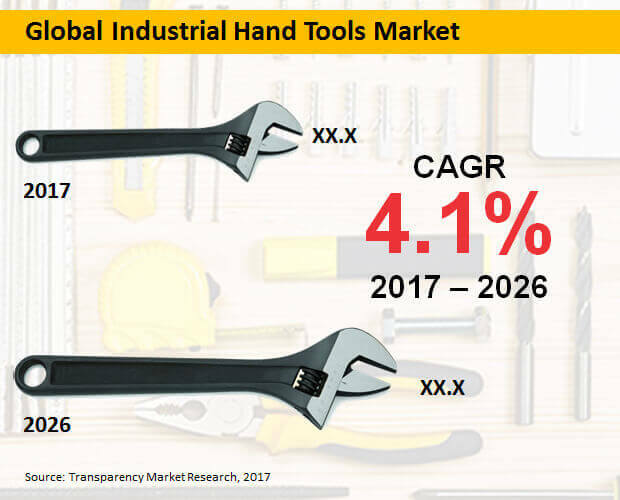 According to Transparency Market Research (TMR), the global industrial hand tools market is fragmented in nature and is characterized by presence of several manufacturers. Majority of these hand tools manufacturers are competing one another to gain maximum revenue shares, thereby intensifying the competition landscape of the market. Leading vendors in the global industrial hand tools market are focusing on expansion of their presence across emerging markets, and are acquiring smaller enterprises to increase their product portfolio. TMR’s report has profiled key players underpinning the market expansion, which include Akar Tools Ltd., Channellock, Inc., Apex Tools Group, Kennametal Inc., JK Files (India) Limited, Klein Tools, Snap-On, Stanley Black Decker, Wera Tools, Mim Software, Inc., Sciencesoft USA Corporation, Mirada Medical Limited, Siemens Healthineers, Xinapse Systems Ltd, and Toshiba Medical Systems Corporation. The report has projected a moderate growth for global industrial hand tools market during the forecast period, 2017 to 2026. Sales of industrial hand tools around the world are estimated to bring in roughly US$ 14,000 Mn revenues by 2026-end. With growing popularity of online shopping, manufacturers of industrial hand tools are beginning to make changes in their retail strategies, adopting omni-retail channels. These manufacturers have entered into the e-commerce platform and are providing various products with respect to customer requirements. The primary aim of manufacturers in capitalizing on the e-commerce is the expansion of their customer base, while eliminating the need for physical presence across geographies. This strategy will further enable industrial hand tool manufacturers in proliferating their sales in the upcoming years. There has been a significant increase in the number of huge manufacturing plants and industries worldwide, where hand tools are widely employed for various activities. With gradual rise in the industrial sector, adoption of professional hand tool kits is witnessing a surge. In addition, mounting automotive maintenance and repair activities is considered to be a major factor propelling adoption of industrial hand tools. As both service and manufacturing units are comprised in the automotive industries, they are highly prone to technological innovations, which in turn prompts the automotive manufacturers to develop vehicles equipped with advanced & upgraded features. Integration of such advanced features will further create complexities in vehicles, thereby paving opportunities for the development of advanced hand tools. Retail sales will continue to be sought-after among sales channels for industrial hand tools, with revenues projected to account for the largest market share during the forecast period. However, online sales are projected to remain the fastest expanding sales channel for industrial hand tools. Revenues from sales of industrial hand tools through distributor sales will remain sluggish. General purpose tools will continue to be preferred among products in the market. Revenues from sales of general purpose tools will account for over half market share by 2026-end. Metal cutting tools will also account for a major revenue share of the market during the forecast period. In addition, sales of metal cutting tools are projected to reflect the highest CAGR through 2026. In contrast, sales of taps and dies will register the lowest CAGR through 2026. North America will continue to be the most remunerative market for industrial hand tools, trailed by Europe. The Market in Asia-Pacific excluding Japan (APEJ) is also expected to remain lucrative, with revenues estimated to surpass US$ 2,000 Mn by 2026-end. In addition, the industrial hand tools market in the Middle East & Africa (MEA) will exhibit the fastest expansion through 2026, followed by that in APEJ. In contrast, the markets in Japan and Latin America will register a sluggish expansion through 2026.